Sherpas demand decision made by April 28. NO decisions have been made on closing Everest south for the season. I don’t expect it but the Nepal government could. Individual teams are making their decision now. I expect a few to cancel but not many. I expect a fair number of Sherpa to stop climbing this season and forever now but not a huge amount. Reports have 17 dead as of today, more are missing. I expect the death count to increase. We were on the trail that winds through camp (it’s about 3/4 mile from one end to the other). 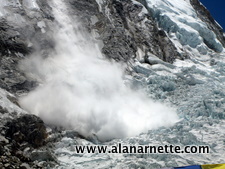 I heard the glacier ice break loose and watched it fall into the icefall. Immediately knew we had a big problem. We saw people coming down and they looked quite shocked. At the same time rescuers headed up, including Phil and six of our Sherpa. Unfortunately very little could be done as the victims were all buried deeply. Helicopters arrived after about two hours and took the injured down to base camp in several trips. They began carrying the dead using a long line. Base camp became a very somber place. Rumors were flying around and no one know for certain what was true or not. Our team joined the Sherpa in their tent after dinner to show our support and respect. We were there for several hours. Things seem a bit more normal today. Although many of the other team’s Sherpa have gone home for a few days, our guys are staying here. Phil says the place is safer now that the weak portion has fallen and I think he is right. We will likely only have one rotation (into the ice fall) instead of the two that were originally scheduled which will further lower our risk. It is after midnight on Everest now and hopefully everyone is resting as they can. The tragic events of the last 24 hours are horrific in the mountaineering community by any standard. 13 are known to have lost their lives and another 3 are missing and will probably be presumed dead at some point, but the search continues tomorrow. In a country where the per-capita income is $500/year, a Sherpa can make $5000 or more working on Everest. This allows them to put their children through schools, build tea houses and pursue a better life for their families. Many of the dead are related to other Everest Sherpas – fathers, sons, brothers, uncles, cousins. They are one large family. This is a human tragedy. This is a time to honor these men doing their jobs, working extraordinarily hard without complaint year after year. This is what they do. I hope the Ministry of Tourism will take care of their families. I know the expedition companies will provide support. But in an event of such magnitude, a reaction of similar proportion is in oder by the Nepal government. There will be no climbing for several days to honor the dead and to allow the route to be rebuilt. Those stranded in the Western Cwm are safe and will return to base camp as soon as the route is re-established. IMG has announced they will continue their expedition but will understand if individuals choose to leave. I expect other expedition to follow suit but also many individual climbers to return home and a few expeditions to cancel altogether. But time is needed at this point. The 2014 event was an ice release, (technically not an avalanche), not snow, and when the serac hovering off the west Shoulder of Everest collapsed, it sent house sized ice blocks all over the route. This is different than a traditional snow avalanche that can be triggered to release by explosives. With hanging ice it may stay there for decades or fall tomorrow, there is no way of knowing or predicting. Thanks to Tim Ripple, Peak Freaks, for posting this video of a similar avalanche, but a bit lower, that occurred in 2009. This will be a time of reflection and healing for everyone on Everest, even those on the north who are unaffected. Climbing is a tight community. If you have climbed long enough, you will know someone who falls. My deep and sincere condolences to all the families, friends and teammates of the fallen Sherpa. I wish peace for those who fell yesterday and for their families for tomorrow. Around 6:30 am, April 18th, an ice avalanche occurred off the West Shoulder of Everest hitting an area just below Camp 1 which is located at 19,500′ but near the top of the Icefall. The estimated altitude was 5800m or 19,038′. At this point in the Everest season, only one commercial team, IMG’s Hybrid group, was in the Western Cwm as they had climbed to Camp 1 the previous day. Many other teams with an estimated member base of 350 non-Sherpas had only recently arrived at EBC and were preparing to make the same climb today or tomorrow. 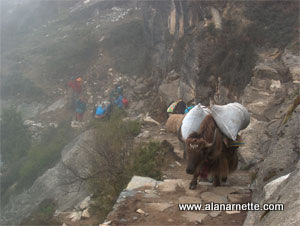 However, there were over 100 Sherpas from multiple teams ferrying loads to Camp 1 and Camp 2. Some had already completed their job and were returning to Everest Base Camp, some were still climbing higher. The avalanche released without warning and so suddenly that it was impossible to avoid the impact. The area of impact is heavily crevassed making rescues difficult. An estimated 100 Sherpas or Westerners were estimated to be above the impact area and are cut-off from returning to base camp until a new route can be put in by the Icefall Doctors, a dedicated set of experts in route fixing within the Khumbu Icefall. This could take several days depending on the damage but these Sherpa are skilled and can do amazing work, plus they will get help for all the other Sherpa. My estimate is that the area that released was a large snow and ice serac located low on the West Shoulder of Everest. This serac has generated great concern for years and was one of the reasons Himex canceled their 2012 season for fear it would release. It has released three out of the last four years. Immediately after the avalanche spray subsided, Sherpas searched the debris field and found 8 survivors. Eyewitnesses reported boots protruding through the snow. Many however were buried and their bodies recovered later. A person can suffocate within minutes when buried under heavy snow. Avalanche beacons are rarely used by Everest climbers but have been used for several years by Himalayan Experience, aka Himex- Russell Brice. None of their Sherpas were involved in this incident so it is unclear if beacons would have aided in the recuse. Also, the search team must have had proper search equipment to use the beacons. This incident may change how teams view this valuable tool. Helicopters were called in to take the bodies back to base camp using the long line technique where the body is attached to a line connected to the helicopter thus avoiding having the helicopter land on unstable terrain. Survivors were flown to Lukla or Kathmandu for further ment. The Sherpas worked for seven different expeditions including the team filming the planned wingsuit jump by Joby Ogwyn from the summit on May 11. The recently announced safety improvements such as dual lines, government officials at base camp and trash collection had no impact on this tragedy. As of this post, Friday, April 19, 9:00pm in Nepal, it is unclear what will be the impact of the remaining season. IMG has announced they will continue with their expedition. and that various teams have agreed to stay out of the Icefall for two days to allow the icefall doctors time to get back up and rebuild the climbing route. I want to express my deepest condolences to the Sherpa families for this loss. Update 1: IMG reports 1 of their Sherpa slightly injured rest OK. Important as they were only western team in the area at the time, I believe. Early Friday morning, April 18th, an avalanche off the West Shoulder of Everest has buried climbers, mostly if not all were Sherpa, working to carry loads to Camps 1 and 2. At least two Sherpa are confirmed killed in avalanche and at least two have been rescued but many more are missing. Remember that early report are always wrong so please consider this as an early report. However, I have eyewitness reports. Rescue is underway and helicopters have been called. All climbing has stopped for the day. 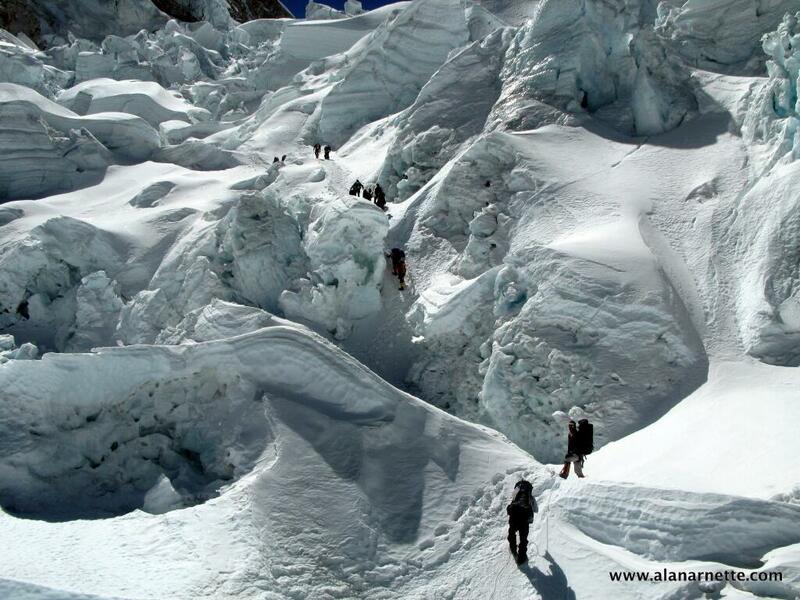 The avalanche hit just below Camp 1 and above the top of the Khumbu Icefall according to eyewitness reports. I am safely back at Base Camp. I was climbing through the icefall this morning at about 6am when a very large avalanche struck a couple of hundred meters above us. I was with my incredible Sherpa, Phu Tsering. We watched the enormous avalanche cloud approach us and we were both covered in snow dust. After some initial concern, we knew we were safe and essentially out of harms way. Phu Tsering chanted some Buddhist prayers and made an offering to the mountain. The avalanche cloud covered us, but fortunately we were a couple of hundred meters under the impact zone. There were many climbers and Sherpas above us, higher in the icefall, and an unknown number of them (reportedly all Sherpas) have been killed and injured. The rescue is underway and many Sherpas and westerners were rushing up the mountain to assist in the rescue as I was descending. I am extremely grateful to be back at base camp and feel deeply saddened and shocked at the loss of life today. My prayers are with all touched by this tragedy. This area is known for avalanches. In 2010 an avalanche actually hit Camp 1, destroying many tents and causing some injuries. Camp 1 was moved further away from Everest and more towards Nuptse as a result. In 2012, an avalanche released off Nuptse and into the Western Cwm near Camp 1 and one Sherpa cook was swept into a crevasse but was rescued and taken back to Kathmandu with back injuries. Another released in 2013 with no serious impact. The most Sherpa killed on Everest thus far was in 1922 when an avalanche on the North Col killed 7 Sherpa. There have been 86 Sherpa deaths on Everest since 1922 with 27 deaths from avalanches and 12 from a collapse in the Khumbu Icefall. The largest number of deaths in any single season was in 1996 when 15 died on both sides including 3 Sherpa. 8 died in one day on the South side on May 10/11. I will update this post as I get reliable, confirmed information. Thank you, sir. The listing of those who died. I’ve an old friend from Khumba…very relieved I’ve not found his name. Perhaps, the climbing community will protect and compensate these guides in a manner appropriate to their services – in a manner they would compensate their own family for like risks. Heard alpine ascents is pulling their team. No surprise as it seems they were hit pretty hard . Any others this far Alan? Yes, Alan saw that. excellent post, thanks once again. Jennifer, another way to look at this is Everest has about a 3.8% death to summit ratio while K2 is 26%. For reference the deadliest is Annapurna at 35% and safest is Cho Oyu at 1.5 – per Himalayan Database. Steven Halton thank you for sharing your views. So sad. I was wondering whats happening on the Northern side? has the accident stopped climbing from that side as well?